On 15/10 Bart Brands will present 3 scenarios we developed for the public space of the Technical University in Dresden, Germany. Last Spring, karres+bands won the selection to create the master plan for the area. The campus of the Technical University Dresden is situated on the edge of the inner city. The vast area has a large diversity of urban and architectural structures. In addition, the campus is defined by a large variety of landscape features and atmospheres. 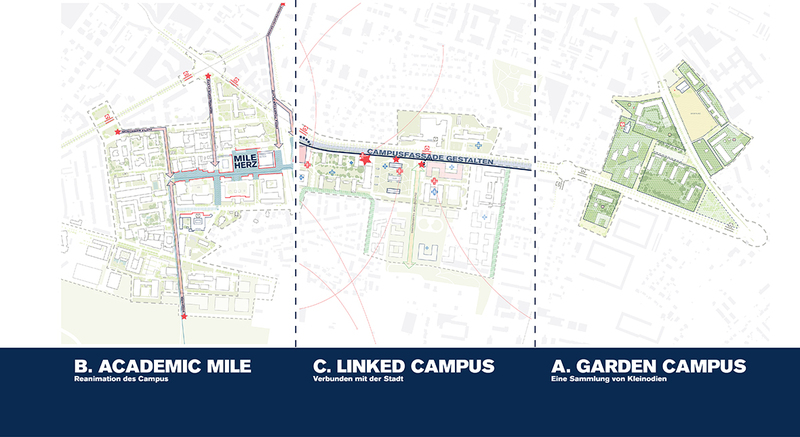 In relation to the 200 year anniversary of the TU Dresden in 2028, the masterplan will function as a base for the development strategies of the university campus and will determine the most relevant projects for realization. The public presentation of the three different scenarios for the future development of the university campus will be followed by an open discussion. The outcomes of this discussion will be included in the Campusplanning Masterplan that karres+brands will complete towards the end of the year. After an introduction by the Kanzler of the TU Dresden, Herrn Dr. Handschuh, and professors of the Institut für Landschaftsarchitektur, Bart Brands will show the scenarios which will then start the conversation.